We hope you weren’t too taken with the story of young Bryan Mills. As reported, NBC has removed season two of its Taken TV show from the schedule. Now, the Peacock network has announced the second season will resume Saturday, May 26, 2018 at 8:00pm ET/PT. 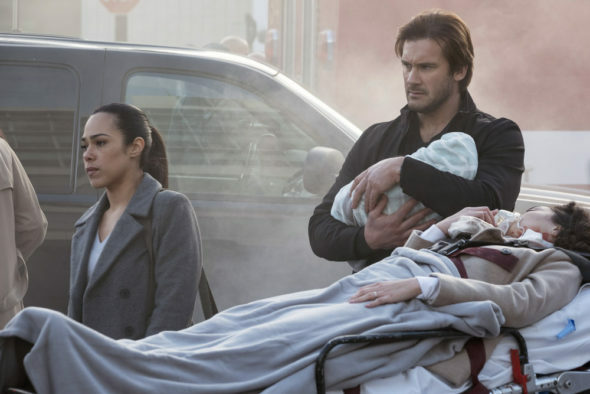 Note two things about that return date: the network is moving the show from the ICU that is Friday nights, to the hospice that is Saturdays, and the second season of Taken will not resume until after the conclusion of Nielsen’s May Sweeps ratings period. An NBC crime thriller, Taken is a prequel to the Luc Besson film franchise starring Liam Neeson. The Taken TV series adaptation stars Clive Standen as a young, but already lethal Bryan Mills. The cast, which was retooled after a flagging freshman season, also includes Jennifer Beals, Adam Goldberg, and Jessica Camacho. The story centers on Mills, as he and his team undertake rescue missions around the globe. According to NBC’s programming schedule, beginning Friday, May 20th Dateline NBC, which typically runs for one hour at 10:00pm ET/PT, will air from 9:00 to 11:00pm ET/PT. Meanwhile, the Taken show page, on NBC.com, confirms the May 26th return date. In addition, Deadline reports: “Taken already was considered a likely cancellation, and the scheduling move makes that certain.” While the network has yet to confirm that it has cancelled Taken, don’t bet your grocery money on season three renewal. The second season of Taken is averaging a 0.44 rating in the 18-49 demographic and 2.764 million viewers. Compared to season one, it is down by about 56% and 46%, respectively. By both measures, it is the lowest rated of NBC’s scripted TV shows. It’s really due to international sales that Taken was renewed for season two. What do you think? Are you a fan of the Taken TV series? Are you sad that it it is cancelled? If it were up to you, would NBC cancel or renew this TV show for a third season?